There has been a new advancement in our mission to take STEEM to the next level. Every new listing on any exchange will strengthen the community and the blockchain as a whole. In clear words, it will impact the price of the token positively over a period of time. Stay tuned! 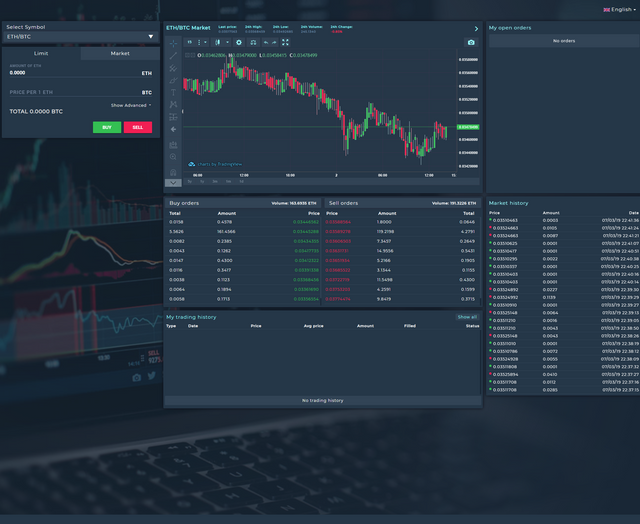 Swixxo is a newly launched cryptocurrency exchange with low fees powered by a cutting edge trading platform. Swixxo offers its Swixxo Crypto Asset Platform (Swixxo CAP) to users. The platform is intuitive, reliable and secure. With access to a wide range of cryptocurrencies , which we are continuously expanding, our trading application’s simplicity pleases beginner traders, and its powerful order functionalities are loved by experienced traders. We continuously enhance our platform according to our users needs. The Swixxo Steem account is @swixxo. They have recently opened it and will start making announcements soon! Please go follow and be ready for more cool announcements in the near future. Free trading in beta phase. 1 month additional free trading. Thereafter 15% life-time discount on trading fees. So what are you waiting for? Start trading your favorite cryptocurrencies including STEEM. If you are a DApp owner, your might be interested in our new account creation API. It helps small DApps with little SP or RCs to create their own sign up process to onboard new users on the Blockchain. You can read more about it in this blog or directly go to http://go.oracle-d.com/acapi to register. It is available only for the DApp owners and not for the regular endusers. Thanks @oracle-d for your numerous contribution to the steem blockchain and to its community. This is such a wonderful news indeed for steem listing in swixxo-exchange. Steem has started expanding its presence in various exchanges and on top of that exchange is also rewarding early users/tester with free trading and additional benefits like 1 month free trade and 15% discount life time on trade fee. Welcome to the steemit community @swixxo and might I add it is a really good idea to list steem token and its affiliate SMTs on your platform. Steemit is one of the fastest growing communities with a very efficient blockchain with great potential. I'll also extend the kudos to @oracle-d and appreciate the effort put into taking steem to the moon by easing the integration of new projects like this, as well as its support for new developers on the platform. I'll gladly help with the beta testing. One again, @swixxo, glad to have you on board. Ofcourse #steem seemented it's feet strongly in cryptocurrency market, so every exchanges giving priority to listing steem base coin. This is very good news that Swixxo Exchange giving tree 1 month additional free trading in beta phase. I have already voted for vitness resteemed this post to spreading awareness. Wow! This is super amazing. Sure I'm gonna be among the beta testers to gain all the aforementioned fringe benefits. Yo buddies; @camzy, @amec, @smithmadu, @pearlumie, @illuminatus, y'all needs to see this. Steem is going to the moon 🚀🚀. @oracle-d Team, Definitely this is good news and more listings of Steem will going to strengthen the Steem Ecosystem and as you said team, it will going to impact the prices in coming future. I will check out this for sure. Stay blessed team. Thanks for this amazing opportunity, I going to be among the best tester of Swixxo. This is a great collaboration. I welcome @swixxo to the steem blockchain. I am not an expert via Crypto trading. I hope to utilize this exchange for exposure and experience about trading Crypto. This indeed has the potential of taking steem to another level as the steem token gains more publicity on the exchange. Great News more and more exchanges are listing Steem pairs! I hope markets will appreciated soon. Thank you for all you do for us as a community. Swixxo account opened and ready for the aforementioned benefit. A whole 1 free month trial. Resteemed so that my friends can see it too. Never heard it before, gonna try it! Haven't heard of Swixxo before, but I can tell from afar that the exchange has a lot in stock for the steem community. This year is definitely steem's year. Hey guys check this out: @yandot @cryptogod2018 @harbysco @joshelior @burlarj. First time hearing about Swixxo, I will try to be among the better testers of this new exchange. Thanks for getting Steem listed, this will definitely make Steem great and become more valuable. Your works are amazing for this blockchain. Have you heard of this news? This is so cool, thanks for the info @horpey, hopefully will try to check it out soon. Very interesting! Thanks for the great news. Another good news for Steem. @oracle-d, Firstly thanks for sharing big news to steemians. This is super excited news. Steem ready for moon with listed more exchange sites. We can get best benefits if we enter through Beta Testers. Swixxo Exchange adds steem would be great chance to will add steem another exchanges. I like how increasingly more people understand the Steem's value and add it on more exchanges. About 148.09$ has been spent to promote this content. I am very supportive of what you say, nowadays you really need people like you, and I hope that you like what you are running. WOW ! this is amazing ! CONTRIBUTION or taking a part in STEEM community provide grow up.& that is COLLABORATIONS that can help the steem community. Truly #steem seemented it's feet firmly in digital money showcase, so every trades offering need to posting steem base coin. This is such a great news in reality for steem posting in swixxo-exchange. Steem has started developing its quintessence in various exchanges and over that exchange is moreover remunerating early customers/analyzer with free trading and additional preferences like multi month unhindered business and 15% discount life time on trade cost. Have up-gave a ticket you a role as onlooker @Oracle-D and resteemed this post to attract all the more assembling of individuals. An obligation of appreciation is all together for this staggering shot, I going to be among the best analyzer of Swixxo. Great initiative, I am going to be among the best tester of Swixxo. wow, such a good news. thanks for this amazing news. Yeh thanks fir letting me know i will try it soon and really loved that they are charging such less fees and yes after using it i will try to spread it out to everyone around. I am very happy by your success. Wonderful post. Thanks for this post. Congratulation you win the "Make it rain" upvote round ! because you deserve it ! keep posting and Steem on ! woow. . Swixxo is extraordinary because it launches trade at a low cost. and has very good benefits. of course I will register it. you @oracle-d is very kind. You try to always support steem. I pray that you will always be given health. @steemium purchased a 40.58% vote from @promobot on this post. You are a genius. Actually your post is very nice you can improve one day.this is very good news that Swixxo Exchange giving tree 1 month additional free trading in beta phase. I have already voted for vitness resteemed this post to spreading awareness.I understand 90 percent of you in this post. If you post more beautifully, we will understand better and we can improve. Thank you for posting this type, we want you to be able to improve one day. The perks are really amazing from the exchange and in the end of the day this will benefit in the rise of Steemit. 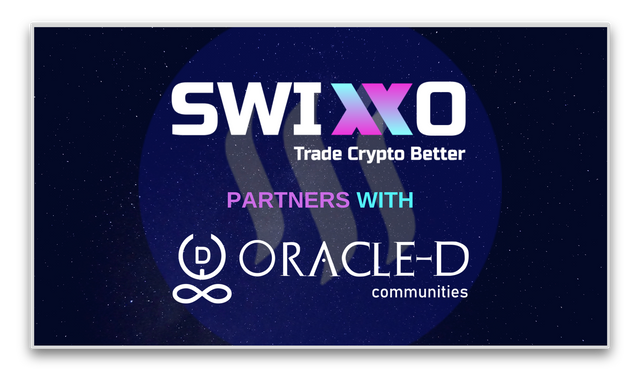 This article introduced "Swixxo Lists STEEM: A Partnership with @Oracle-D " to Japan. I like how continuously more people understand the Steem's regard and incorporate it more exchanges. Thanks, @oracle-d for posting this. I have experience in Testing domain. Sure I will participate in this Beta testing. Hope my experience in this domain may help. Thank you. And Welcome to the Steemit community @swixxo. Much appreciated @oracle-d for your various commitment to the steem blockchain and to its locale. Welcome to the steemit organize @swixxo and might I incorporate it is an incredible arrangement to list steem token and its branch SMTs on your stage. Steemit is one of the speediest creating systems with a very gainful blockchain with remarkable potential. I'll furthermore extend the credit to @oracle-d and welcome the effort put into taking steem to the moon by encouraging the compromise of new exercises this way, similarly as its assistance for new originators on the stage. #steem seemented it's feet immovably in computerized cash publicize, so every exchanges offering need to posting steem base coin. This is incredibly elevating news that Swixxo Exchange permitting tree multi month additional free trading beta stage. I have recently casted a ballot for vitness resteemed this post to spreading care. The adventure to top begins with a solitary advance. Gradually the name which is inside Steem. Blockchain, is getting own character in each trade. The most critical now, @oracle-d has effectively transformed Swixxo which is the reason we the early analyzers are getting so much advantages. Brilliant news hping to check these out now!!! This post has received a 30.29 % upvote from @boomerang. Thankful to you for all that you achieve for us as a system. Swixxo account opened and arranged for the recently referenced preferred standpoint. A whole 1 free month starter. Resteemed with the objective that my mates can see it to. Another uplifting news for Steem. Keep us refreshed. More power. Go along with me, let us do this for steem.. Initially a debt of gratitude is in order for sharing huge news to steemians. This is excessively energized news. Steem prepared for moon with recorded more trade destinations. We can get best advantages on the off chance that we enter through Beta Testers. Swixxo Exchange includes steem would be incredible opportunity to will include steem another exchanges. You got a 52.60% upvote from @brupvoter courtesy of @steemium! I like how logically more people grasp the Steem's regard and incorporate it more exchanges. You are completing an incredible work for the steem blockchain @oracle-d, may you be fortified to accomplish more. How many trading pairs do they have right now? How in the world do you find STEEM trading pairs. Couldn't see that anywhere. Such an uplifting news. A debt of gratitude is in order for this astonishing news. upvoted and resteemed. Much appreciated for telling me I will attempt it soon and truly adored that they are charging such less expenses and yes in the wake of utilizing it I will endeavor to spread it out to everybody around. The advantages are truly astonishing from the trade and toward the day's end this will profit in the ascent of Steemit. Steem is making big moves. Their presence on multiple exchanges has already been increased massively! Grazie mille per tutto ciò che fate per noi!!! Prego! E’ il minimo che possiamo fare! Wow! its really great news for me as a #steem lover. And hopefully all steem users will be happy after seeing this great news. Resteem for more visibility. Glad to hear steem added to another exchange. Is there any trading contest on this exchange? This good news will help steemit ecosystem increase value in the future.